208 pages | 55 B/W Illus. Software is cut and dried—every button you press has a predictable effect—but qualitative analysis is open-ended and unfolds in unpredictable ways. This contradiction is best resolved by separating analytic strategies—what you plan to do—from software tactics—how you plan to do it. Expert MAXQDA users have unconsciously learned to do this. The Five-Level QDA® method unpacks the process so that you can learn it consciously and efficiently. The first part of the book explains how the contradiction between analytic strategies and software tactics is reconciled by "translating" between them. The second part provides both an in-depth description of how MAXQDA works and comprehensive instruction in the five steps of "translation". These steps are illustrated with examples from a variety of research projects. 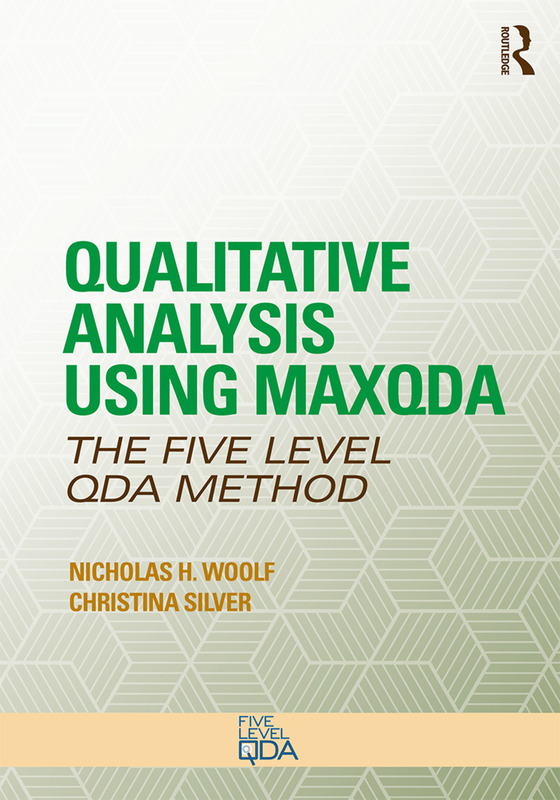 The third part contains real-world qualitative research projects from a variety of disciplines, methodologies, and kinds of qualitative analysis—all illustrated in MAXQDA using the Five-Level QDA method. The book is accompanied by three sets of video demonstrations on the companion website. The functionality and interface design of MAXQDA for Windows and Mac are identical. The Five-Level QDA method learned from this book is therefore the same whether you are working on a Mac or Windows computer. The Five-Level QDA method is based on the authors’ combined 40 years of experience teaching MAXQDA and other software packages used as platforms for conducting qualitative analysis. After many years observing their students’ challenges they developed the Five-Level QDA method to describe the process that long-time MAXQDA experts unconsciously adopt. The Five-Level QDA method is independent of software program or methodology, and the principles apply to any type of qualitative project. Nicholas H. Woolf has worked as an independent qualitative research consultant, coach, and trainer since 1998. He has conducted or consulted on numerous research studies, from single-site to multinational studies in various fields in the behavioral sciences using a wide range of methodologies, from highly structured content analyses, to evaluations, grounded theory-style projects, and interpretive phenomenology. As a trainer Nick specializes in teaching qualitative analysis using ATLAS.ti. He has conducted 285 workshops at over 100 universities and other institutions, primarily in the USA and Canada, for more than 3,000 PhD students, professors, and research and evaluation consultants. In 2013 Nick introduced Five-Level QDA in his keynote address at the first ATLAS.ti users conference in Berlin (Woolf, 2014).